It got my brother through long study sessions for his MCAT exam, and accompanied fellow Fonograma critic, Pierre Lestruhaut throughout his summer trip through Europe. “Chola” was, and is, one of the true summer jams of the summer (and perhaps the most steamy indie tune since MKRNI’s “Humedad”). Sequenced and chopped in a bowl of bedroom pop and dembow, “Chola” (described as “hip pop”) is the type of song that’s easy to put on loop. Despite the base synths that encircle its melody, this track triumphs because of Bill Yonson’s decision to put his heart on his sleeve and burst the song on a single breathe –proving that pop music doesn’t need a repeat of the chorus to be catchy. 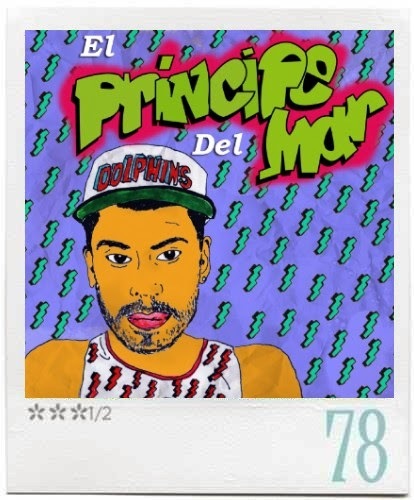 At less than three minutes long, “Chola” initially seemed like a teaser of what we would find on Yonson’s latest album, El Príncipe del Mar. Truth is, you won’t find a better or catchier song on the album. Yet the songs that surround it, make the single acquire an ever bigger lush and purpose. Paying an out-loud homage to The Fresh Prince of Bel-Air on its aesthetics, this is a work that surveys popular culture without fully conceptualizing it. Yonson’s approach is not vague either. Whether singing/poetizing about Whatsapp (a good companion to the surprisingly entertainment hit, “Los Mensajes del Whatsapp” by El Cartel de Santa), or giving a shout out to Tex-Mex diva Selena in “Triangulo,” Yonson comes off as a leisure-loving chronicler more than just a pastiche/opportunist. Comedic hubris goes a long way in times of memes and vines. Opening its canvas with eerie ambulance sirens in the intro track “Salir en Secreto”, El Príncipe del Mar is smartly paced in its negotiation of beats, vocal hooks, and tropical hues. The initial reactions to the album were truly polarizing –some people even called it controversial. Perhaps those antagonizing it are the same people that still refuse to the idea that urban music can intersect with the so-called introspective genres (like it or not, Mexico is still far behind on its appreciation of urban music). But the suspension of disbelief is not fully unwarranted. For one, the abuse of autotune and decodings here can prove to be taxing (especially in its three collaborative tracks featuring Marinero, Capullo, and Letter D). It’s not an easy swallow, and doubting its cultural appropriations seems appropriate. Perhaps Bill Yonson’s biggest accomplishment here is referring to his music as pop music –serving and contributing to the all-encompassing opportunities offered by the word itself.